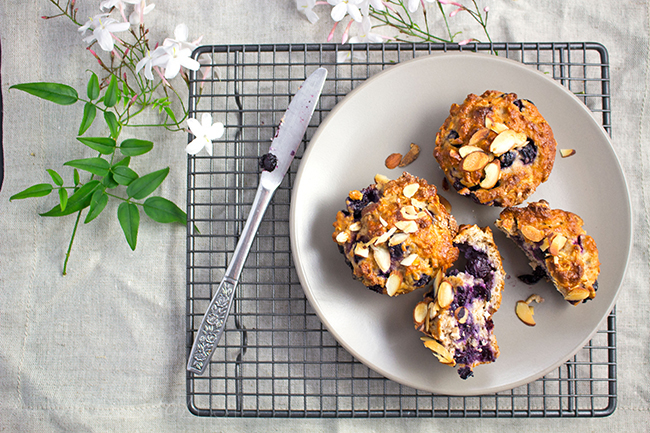 Packed with flavor and bursting with blueberries, these 8 ingredient, whole-wheat blueberry and oat muffins are the best tasting healthy muffin ever. So you know how I have been whinging lately about the soggy and depressing weather that we have been experiencing down here in NZ for what feels like forever? Well my friends, that all changed this week. So far we have not even had a drop of rain, which is no doubt going to change next week. But still you have to take it as it comes right? The sun has finally been able to burst through the clouds and smother us with its rays of light. Warming our bodies from the outside in. And not only have we been able to go outside and soak these beams of glorious heat up, but so have the dogs. The have been absolutely loving it, lounging around on the deck, basking up the rays. Rip especially loves to sun bake. He stretches himself out as much as he possibly can to get optimal sunlight saturation. He even follows the sun as it moves along our enormous deck. It is so super cute. All this beautiful sunshine got me wanting some lightened up baked goodie in my life. Preferably something leaning towards the healthier side, packed with berries and (since I hadn’t had one in a while) in the form of a muffin. 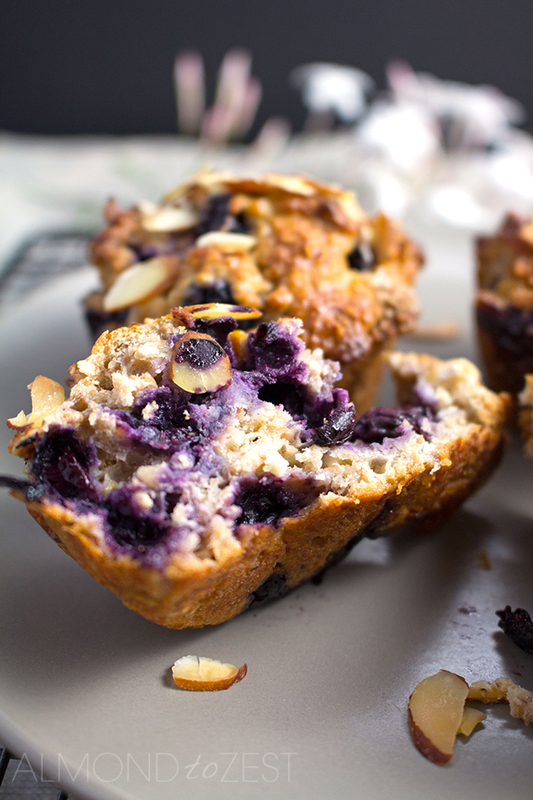 So I decide to grab out my muffin tin and jazz up an old favorite, these WHOLE-WHEAT BLUEBERRY MUFFINS. We used to make these muffins (WHOLE-WHEAT BLUEBBERY MUFFINS) at the café and they would sell out every time we made them. Which was pretty much everyday. The customers just loved them, and no doubt you will too. For starters they are exploding with blueberries in every bite. I love to put heaps and heaps of fruit/berries/goodies into my muffins. Some people may even say an excessive amount. But I think there is nothing more boring than biting into a glorious looking muffin only to find it is basically all batter and no goodies are to be found. In this batter I use 2 whole cups of frozen blueberries, but you can use fresh if you prefer. I like using frozen as they give an epic bleeding effect through the batter, making the muffin look even more delectable than usual. 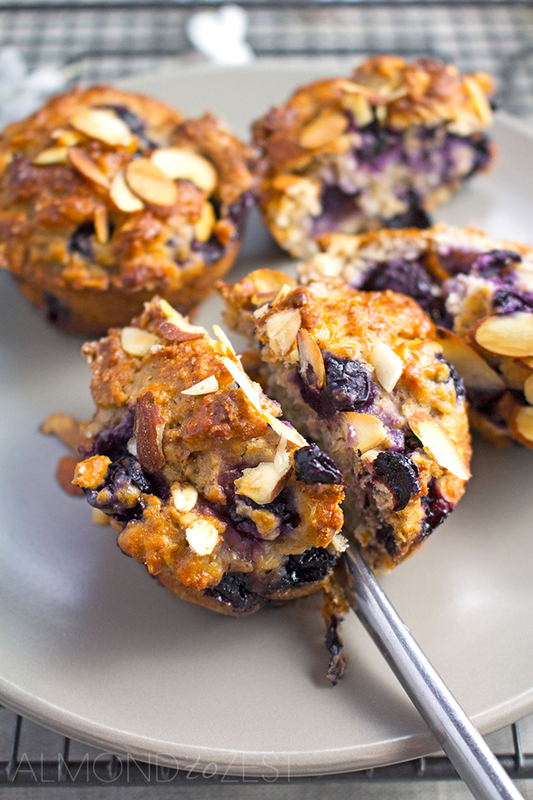 Secondly, the texture of these whole-wheat blueberry and oat muffins are to die for. Using whole-wheat flour in the batter gives the muffins a denser texture than your usual type of white flour muffin. I added oats into the batter for this new jazzed up version, which made the texture even more amazing than the original recipe. Plus all that added fiber keeps you fuller for longer. 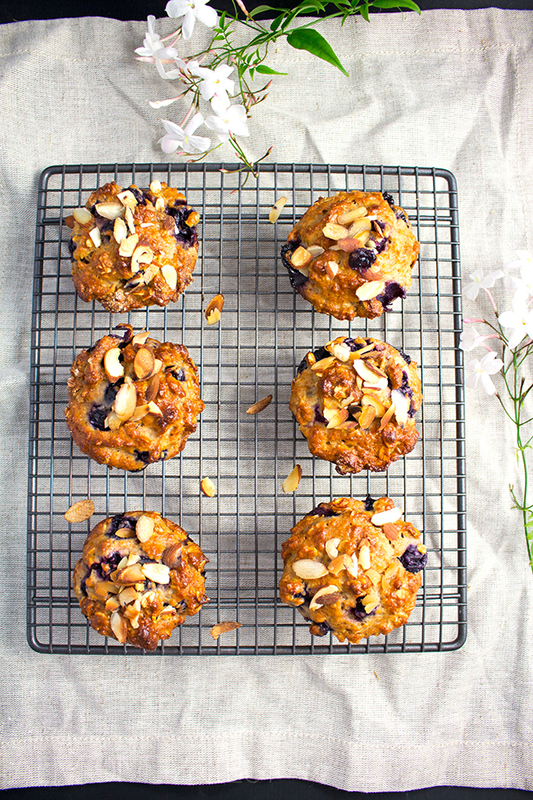 These whole-wheat blueberry and oat muffins are made healthier by the use of yogurt, which adds to the denser styled texture of these muffins. And a small amount of oil is used instead of the usual use of butter. I have replaced the use of white sugar in this recipe with brown sugar, which has increased the flavor and is also a healthier alternative. These muffins are defiantly the kind that you can eat anytime of the day. 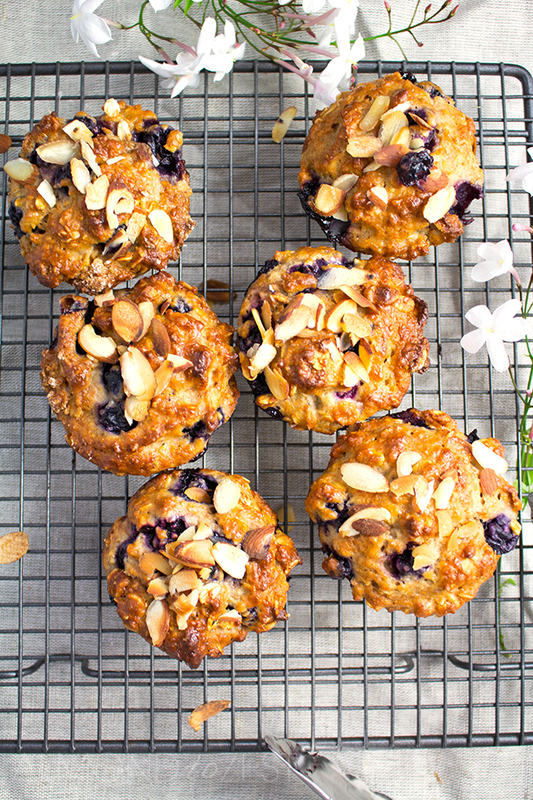 Since they are not overly sweet, relatively healthy and bursting with blueberries I think you can justify eating these for breakfast, as a mid morning or late afternoon snack, or even as a pre or post workout filler. If kept correctly in an airtight container they should last for 3-4 days. While you’re here you may like to check out some of our other healthy delicious muffins like these PINEAPPLE, LIME, AND COCONUT MUFFINS – our most popular post to date. Or maybe our CRANBERRY AND APPLE MUFFINS are more your style – packed full of Christmassy flavors and exploding with fruit. Or a must try are our PEAR, GINGER AND CHOCOLATE MUFFINS – ok the chocolate part isn’t that healthy, but the flavor of these are worth being slightly naughty for. 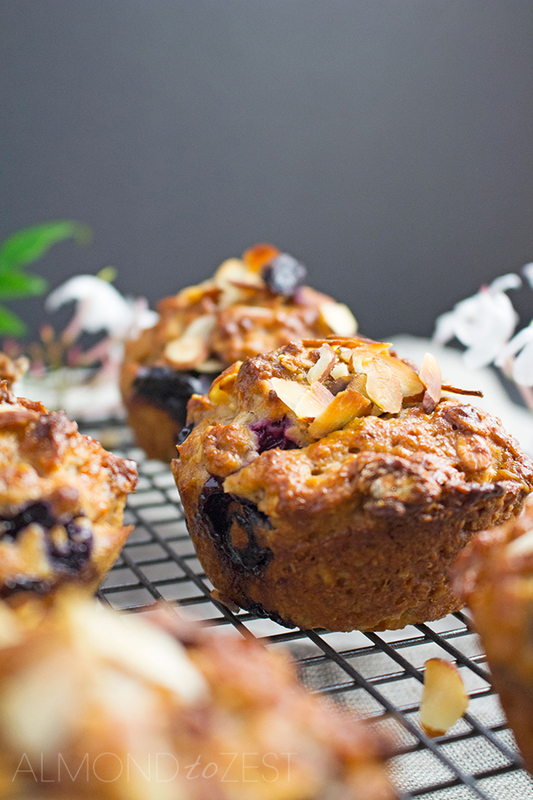 Great muffins – hearty and jammed full of berries. I added a couple dashes of nutmeg. Making 1 1/2 batches filled 2 mini muffin trays perfectly. The kids *devoured* these tasty bites. Would be great for a brunch or lingering breakfast.